Discussion in 'Portable Vaporizers' started by spyder, Jul 3, 2008. Yes, you can flip the clamps over or rotate the pan to get fresh wood. The problem is, that base parts, which have been used over years are deformed and don't match the drilling jig any more. Without the drilling jig, it is harder than one might think. If you have a close look you can easily notice, that the holes are off center, the tubes are in the center. Just a small detail. The drilling jig is very precise, the body has to go in there without too much pressure (wood cracks) nor too much play. I always machine the two cones of the bottom part at a certain degree of moisture and before drilling the 14 holes (classic vapman), I make sure the wooden bodies have the same level of moisture as when turned on the lathe. Myself, I never tried to drill these three holes with a hand drill only. Dutch-Mic, Gourmet, Hogni and 5 others like this. @vapman @OF the screws all still fit well and I had no problem removing the posts after the bowl broke off. I also removed the mica so I'm not sure how much that will effect the repair. Currently the midsection is worse for wear and need a new one, the bowl has seen better days before it broke off and I took my flakey mica off to char the body. On another note I know that gold and copper is use because copper is barely behind gold when it comes to heat and electricity. I heard that Silver was better than the both of them in terms of heat and I'm curious if you tried a Silver plated bowl before or even played with titanium? vapman and OF like this. Good to hear the wood is sound, no need for heroic efforts to repair? I think the Gold plating is to stop corrosion of the Copper, not for thermal reasons primarily. Silver would not offer the protection the Gold does, Silver plated electrical connections rapidly turn black. OTOH Platinum plating would also be inert....... So what if it's more expensive than Gold, this is a VM after all? tennisguru1, Dutch-Mic, Gourmet and 5 others like this. Copper is the second best conductor behind silver, gold comes third! But copper has a higher heat capacity (storage of heat energy (Jules) per weight) compared to silver and is therefore THE best metal for a heating pan for a vaporizer like vapman. As OF wrote, gold is only for aesthetics and has no thermal effect. The first series of vapman were without the gold coating. I also removed the mica so I'm not sure how much that will effect the repair. Without the mica, the diameter of the cone isn't right anymore, therefore I will have to underlay the clamps with small bits of mica. Installing new heat shields after the drilling is done is very difficult and not really worth it. 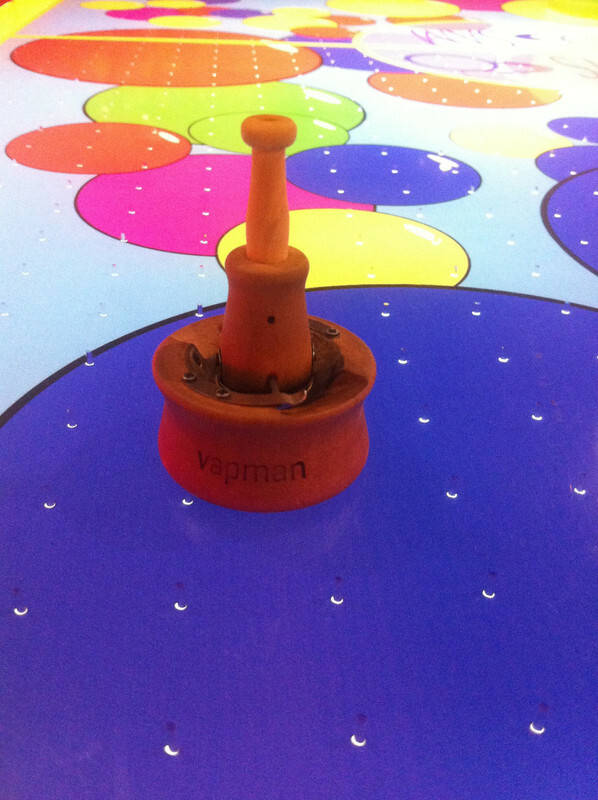 When making the vapman, the holes in the wood and the mica are drilled at the same time with the aid of the drilling jig, otherwise it is almost impossible to locate the holes underneath the mica. Instead of sending in your vapman for repair, it would be less costly, if I send you a new copper bowl with the tubes already mounted and a new mid-section, this would save us shipping fees and possible paper works with the customs. Because the base part is over 2cm, it goes as a parcel and costs much more than sending the pan and the mid-section only, they both are under 2cm and can be sent as a letter. Another option would be; you purchase a model with slight blemish for a much reduced price? Do you mean in general or just in regard of your vapman? Sorry, I might miss the joke because of language barriers. Dutch-Mic, Vapeur Rogue, The Beagle and 7 others like this. Well I guess its time to let go of my old friend. I still have the lovely yew basic, just feels odd owning 1 but it makes it all that more special. @vapman as for my comment on legislation it has nothing to do with your products but does effect products that "appeal" to children like the Vapor Genie due to its colorful nature. Where I'm from in Canada, Manitoba has the worst laws in Canada. We cant grow any plans though Canadian laws say we CAN but not our province. Also you cant legally smoke weed unless you're a medical patient or own a house. I say this because in MB you cant smoke in public and if you live in a condo or apartment that doesnt allow it you cant smoke in or outside of your residence. You could always smoke at a friends house or backyard but you have to wait atleast 5 hours before you can commute. vapman, Dutch-Mic, hujdimislav and 2 others like this. Time to buy a house then! Dutch-Mic, WoodVillain and hujdimislav like this. Also for you Vapmen that have used or owned both the basic or complete which one do you prefer and why? Winner for me is the basic. Just not a fan of the mica, look wise I find the charred wood gives character and the mica is not pretty and when mine flaked it didnt do it any favors. I also found that my basic Yew has better airflow and easier to clean. The one thing I do like about the complete is the finish and I've been debating to oil my yew. Does anyone have experience doing so? Whissmu, vapman, Dutch-Mic and 3 others like this. To be clear, I've no experience oiling your yew. FWIW I've never seen your yew nor have any desire to, thank you very much. What you do with your yew in the privacy of that 'first house' is OK by me, of course. As long as the VM consents, of course. I have, however, used the standard finish (Linseed Oil) on any number of wood items over the years. It's the classic finish for rifle stocks, for instance. Both fine multi thousand dollar custom guns and 'run of the mill' military wood. A WWII or even older stock is still well protected and fit for duty today, despite a lifetime of hard service. Very tough stuff, and potentially pretty too. You can put on thin coats (often with your fingers a drop at a time) and shine it up until it glows if you care to. Stick with boiled Linseed oil, raw can take forever to dry. There are fast dry versions, using strange stuff like 'Japan dryers' that are faster and easier. Gun shops and online stores sell small jars. Personally I steer clear of them for items like this where you might ingest some accidentally, as some of the chemicals added can be pretty scary. The oil itself is 'organic', as the name implies, like Olive oil or other vegetable oils. Standard high grade boiled for me. Don't buy too big a container, once air hits it it starts to harden an degrade. An old timer trick is to turn the bottle or can upside down so more air doesn't leak in over time. tennisguru1, Whissmu, vapman and 5 others like this. Hello my dear vapmen; so my daily driver's are my VM my IQ and HI log. Does anyone on here have a dynavap? @Dynavaper How does it compare to the vm other than its higher price? Am I missing out by not having one or is it not worth it since I have a good core of vapes? As always 420 in the 204! Vapeur Rogue, Whissmu, Dutch-Mic and 3 others like this. I recently got a Dynavap M and have mixed feelings about it. Pros :Solid build, no batteries, and easy to micro dose. Cons : VERY restrictive draw and higher learning curve than VM. What I mean by that is I still find it hard not to slightly combust or at least get some char taste near the end of a sesh. I have tried different strains, diff grinds, diff heating positions on the cap as well as single, double, and triple torches. I even filed larger grooves on the tips to allow for more air intake ( advice from longtime users ). Maybe I've become spoiled with my other vapes which have little to no draw resistance. Despite the negatives I do actually like the Dynavap I just wish I liked it more. It will remain in rotation because variety is half the fun. breiter_fighter, Vapeur Rogue, Whissmu and 7 others like this. in_human_form, el sargantano, Ramahs and 11 others like this. You should really give the Ti tip a try with your M. Way less draw resistance. Even when you add the price of the Ti tip to an M you're still slightly under the price of a VM. but the vapcaps remain my go to. And nothing I have found is as durable or as good for my active outdoor lifestyle. The Vapman will be my next vape. Maybe black Friday will bring a sale. I'm really curious about how well it performs. Skunkport, Copacetic, vapman and 4 others like this. - Herb/grind: I prefer a finer grind for the Vapman. The VC does well with all types of grinds and vapes tiny nugs very well. - Loading: You can quickly scoop the tip from the VC in ground herb or put a little nug in it. It takes a bit more time and precision to load the Vapman, but the little funnel makes it a lot easier. - Heat-up time: both heat up quickly. The Vapman maybe needs less butane. - Taste: both taste awesome with low temp hits, but overall I prefer the vapor from the Vapman. Even when the herbs are getting browner the taste is still very good, also with higher temp hits! - Efficiency: both extract the goodies well, but when I use the same amount herb in the VC and Vapman, the Vapman hits harder. - Style of usage: a big difference between the two is that the VC cools down way quicker than the wok of the Vapman. Therefore the VC can be used as a semi on-demand vaporizer. I think that the VC is a good addition to any vaporizer collection because it's semi on-demand and because it vapes all grind consistencies and little nugs easily. That being said, I prefer the Vapman for a longer, calming and pleasing sessions, the taste and effects. It's also the vape that gives me the most relief from chronic pain and I believe that I'm not the only one with that experience. The VM helps me to stay functional, not only as a family man and friend, but also on a professional level. It sounds maybe like a bold statement, but the Vapman improves my quality of life. @vapman I'm so grateful for your vaporizer, thank you! dendamper, Zak McKracken, Stoned Cold and 18 others like this. Anyone got ideas on how to permanently plug one of the holes closed on the wooden piece that connects to the mouthpiece?? I've been using tape but I'm interested in a better solution. Wooden toothpicks and thank you, I knew there was something I was forgetting to get, it bugs me trying to cover them with my fingers. Just break it off in there and kinda jam it in? Sidenote - I'm finding that the vapman is my favorite device to use for keif. Yeah, leave a little bit stuck out so you can always pull it out with a pair of tweezers imo. Word thanks for the great suggestion! While I'm a fan of tape to really decide if it's a good idea (I and I think a lot of others abandoned this 'fix') I think the advice to leave anything sticking out is bad. An invitation to catch on something and damage the mid section? Rather I think the idea is to trim the pointed end so it sticks out a bit ON THE INSIDE then trim flush outside after inserting it. If you decide to remove it later, pull the MP and push it out from the inside enough to grab? Sorry if missed something bbut what shall be the benefit of plugging? vapman, Dattisso and RUDE BOY like this. The vapor will be more dense, but the draw will be a bit less easy. I'had once a very handy elastic rubber band with the right diameter to cover all the air-intakes. Unfortunately it broken after a while. Maybe it doesn't liked the hot air from the heating? Could be, it exist a special rubber band as a gasket for automotive parts or other industrial or technic solutions, that can stand more heat? But if I would like a middelpiece permanently without air-intakes, I would ask @vapman, if he could do me a new one without holes. vapman, Dattisso, Hogni and 2 others like this. Sure. If I measured right a half inch vinyl tube cap with the end sliced off should do nicely. Or 12 or 13mm? Or a short length of half inch ID silicone tubing (again, high temp version)? Decreased airflow produces higher temperatures which produces more/denser vapor and different effects. However extra cold air is no longer allowed to enter, which DILUTES the vapor normally, so the vapor delivered to the MP while it's hotter without it (not a good thing?) it's more concentrated because it's no longer being diluted? While I think guys should experiment here (either with deft finger location or tape), consider the maker takes the trouble to drill those precise holes for a reason? vapman, Copacetic, Dattisso and 4 others like this. I don't think this is true for this vape. Yes it is. Heat is conducted to the weed both by conduction and by air through the 3 small tubes which is heated as it passes through. Blocking the carb holes increases the amount of air drawn through those tubes into the chamber which produces more vapor and it's denser because it isn't diluted shortly after too. vapman, Dattisso, almost there and 2 others like this.